All but one of the Jackets’ top nine batters from last year’s ACC Championship team will be returning to the lineup this year. Combine these returners with a few solid performances by freshmen over the fall, and the team is looking like a strong candidate to contend for the ACC crown and in the NCAA tournament once again. The Jackets’ defensive strength is best seen in their infield. The team turned 77 double plays last season, which led the entire NCAA and set a new school record. Three out of the four starters from that unit return this year in senior first baseman Thomas Smith, sophomore third baseman Brandon Gold, and sophomore shortstop Connor Justus. These three, combined with second baseman Mott Hyde (who has since graduated), manned the infield together for most of the team’s games down the stretch last season and propelled Tech to an ACC Championship with their sound defensive play. The team has some options for their defensive lineup this year. The three returning starters could remain at their positions, or shuffle around to make room for a mix of freshmen and veterans. Smith’s .301 average and 36 RBI made him one of the Jackets’ best players last year, and his .996 fielding percentage and .392 on-base percentage led the team. He will most likely stay at first base, but may move to second to make room for freshman Kel Johnson. 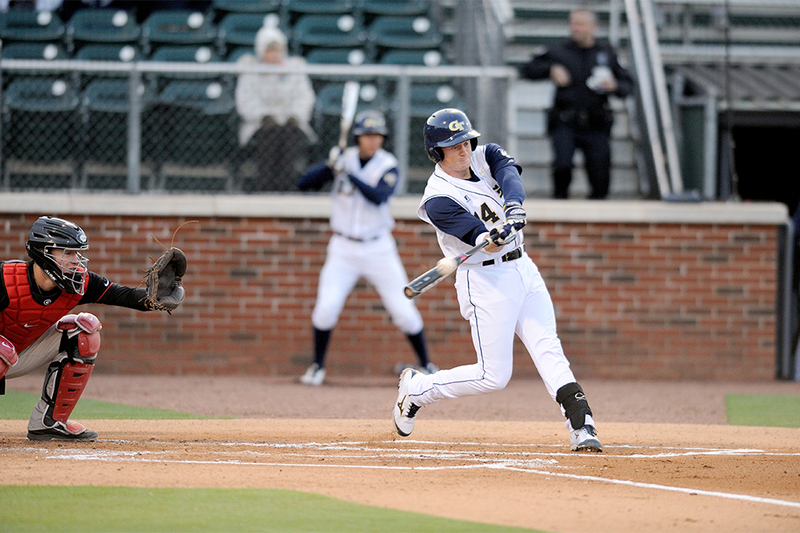 Johnson lit up the White and Gold Series over the fall, hitting 7 for 10 with five runs batted in. He is a versatile player and could instead see action in the outfield or in the designated hitter position. Senior A.J. Murray could also see time at first, as the slugger will bounce between first, catcher, and DH so that the team can utilize his strong bat. If Smith remains at first, freshman Wade Bailey will begin the year in Hyde’s spot at second base. He hit well this past fall, going 6 for 11 with a homer, two RBIs, and three runs scored. Justus has shortstop on lockdown after a strong freshman outing in 2014. He was dependable in clutch situations, hitting .400 with the bases loaded, scoring five game-winning runs, and driving in an additional five clinching RBIs. Gold’s strength is in his glove more so than his bat, but he has worked this offseason to improve at the plate. He will be backed up by freshman Blake Jackson, while junior outfielder Matt Gonzalez could also see action at third. Sophomore Arden Pabst will start the majority of games at catcher after splitting the role with Mitch Earnest last year. While he batted for only a .217 average in 2014 (catchers are not traditionally strong hitters), he has a lot of value in the field. His .991 fielding percentage was second on the team to Smith’s; while his 16 runners caught stealing was second-best in the conference. He played in the Cape Cod League over the summer and spent part of the fall working with his pitchers to develop a level of trust. On his days off, Murray, junior Grant Wruble, and freshman Trevor Craport will take his spot. The entire starting outfield from last year – senior Daniel Spingola, junior Matt Gonzalez, and sophomore Ryan Peurifoy – returns for this season. This is good news for Tech fans, as these players were three of the Jackets’ four best hitters from 2014. Sophomore Keenan Innis will also earn some starts in the outfield this year, while Johnson may also end up there if he cannot find a regular role in the infield. Spingola was a team leader in a lot of categories last year: he had the best batting average (.319), highest slugging percentage (.451), and the most hits (82, leading the entire ACC), triples (8, also the conference leader), stolen bases (15), and runs (45). Just as last year, he will leadoff the order and be very influential both offensively and defensively. Gonzalez’s .314 average and 80 total hits were not too far behind Spingola, and his team-leading 37 RBIs was one better than Spingola’s 36. His nine outfield assists ranked fourth in the nation, which is even more impressive considering he started several games in the infield. Expect a lot of defensive plays and offensive production no matter where he plays in the field. Peurifoy is also strong in both aspects of the game, notching seven outfield assists and a .980 fielding percentage while batting .296 in 2014. Depending on where Gonzalez plays for most of the season, Innis may also become a regular starter in the outfield, after starting 23 games there last year before being sidelined with a hip injury. Overall, this outfield corps is one of Tech’s strongest in a while, and may prove to be one of the most productive in the ACC. Several key pitchers are gone from last year but the good news for the Tech pitching staff is that they return their top two starting pitchers from last year and several more experienced pitchers. The bullpen will have several spots to fill, but overall, the starting rotation has potential to be as strong as ever. The Jackets will face some tough competition this year and with their young and improving lineup, if their pitchers perform to the level of last year, Tech could go a long way this season. Tech is currently ranked in the top 25 by some outlets, but the goal of the team will be to advance to a super regional this year and to play in the 2015 College World Series. Redshirt senior Devin Stanton was Tech’s top performing pitcher last year. Stanton had an phenomenal ERA of 2.24 in 76.1 innings. He struck out 57 opponents and held the batters to an average of .245. Stanton had the team’s lowest ERA, but current sophomore Ben Parr had one of the best freshman pitching seasons in Tech history last year. Parr started off in the midweek rotation spot, but after dominating the competition, he became a weekend starter. Parr posted a terrific 2.62 ERA in 65 innings. Parr also tallied 52 K’s, and had the best K/9 ratio on the team. Junior Jonathan King returns from a shoulder injury from last year. Through four appearances, King had a 1.96 ERA in 18 innings pitched. Unfortunately, he would not pitch again after his fourth start and spent the past year rehabbing from Tommy John’s surgery. Now returning for his third year, King and Tech are hoping he can replicate last year’s hot start and continue to make improvements through the season. Senior Cole Pitts is also recovering from Tommy John’s surgery and is in the running to start this year once he is fully healthy. In four starts last year, he posted a 3.18 ERA. Stanton has undergone that surgery as well and has been helping Pitts through the process. It is still uncertain if Pitts will recover soon enough to be ready for the start of the season or what kind of season he will have. After losing their top two relievers, Dusty Isaacs and Sam Clay, and starting pitchers Matthew Grimes and Josh Heddinger, expect to see some new faces making an impact this year for the Jackets. The closer and setup roles are unknown and only two returning pitchers have recorded a save, King (expected to be primarily a Starter) with two and sophomore Zac Ryan with one. Manager Danny Hall is uncertain of the bullpen situation, and it may be a role by committee for the time being until someone separates themselves from the group. Pitching coach Jason Howell is expecting Ryan, sophomores Ben Schniederjans, Matthew Gorst and Tanner Shelton to play big roles coming out of the bullpen this year. Freshman Jared Datoc, Cory Pope and Daniel Gooden will have a chance to pitch out of the bullpen as well. It will be a monumental challenge to replace the roles of Isaacs and Clay but the coaches and players are confident going into this season. Their first test will be this weekend at home vs. St. Johns. All but one of the Jackets’ top nine batters from last year’s ACC Championship team will be returning to the lineup this year. Combine this with a few solid performances by freshmen over the fall, and the team is looking like a strong candidate to contend for the ACC crown and in the NCAA tournament once again.